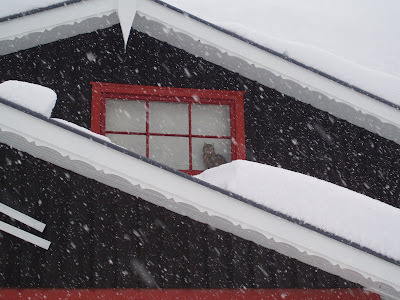 SNOEL'S BLOG: Big snow gets BIGGER!!! Its funny how sometimes nature just takes over and you are reminded how small and insignificant you really are. Its also funny too how it takes our minds a little time to adjust to the reality of the situation we are currently in!!! For the last few days it snowed. That was great except it didn't stop! And actually still hasn't. To the point where we have just on a metre of snow on the ground. 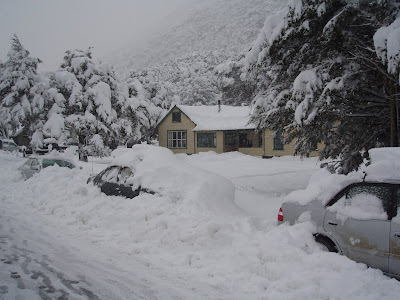 In my experience over the last two winters in Arthur's Pass it normally snows for a couple of days, and then clears, only this time it didn't! And just kept snowing all week. The school group I had were unable to use the road so we sent them out via rail this morning with a few parents remaining hoping to get out tomorrow. 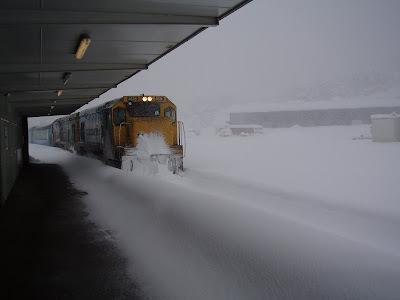 It now looks as if they will be taking the train as well, as it may take days before the snow is clear. The grader kept grading snow to the sides of the road until it banked up so much it has nowhere to go! So all that can be done is to wait until it stops snowing! Moving around becomes difficult as you need to wear waterproof clothing to walk or swim through the banks. 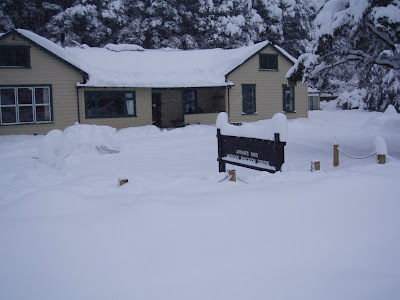 You have to dig out paths and the roof in case it collapses with the weight of tons of snow! Even skiing isn't the easiest way to get around!! My thoghts are with the cat at the wobbly kea - i think the novelty is wearing off! really cool photos. Love the one of the train. Yeah Tim thank goodness for it too, as it was the only way to get the kids out for the whole weekend! So a good call in the end.